on the face of your gift recipient. 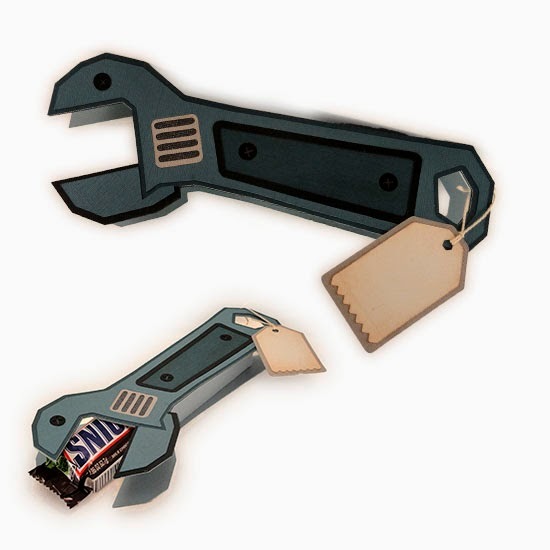 insert bar into box, and give it to your special someone! 1. Identify and cut the shapes. 2. 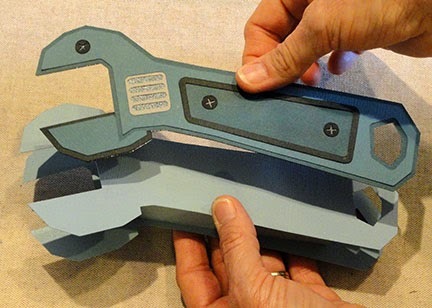 Fold the box inward at all perforations. 3. Join side tab to opposite long box edge. 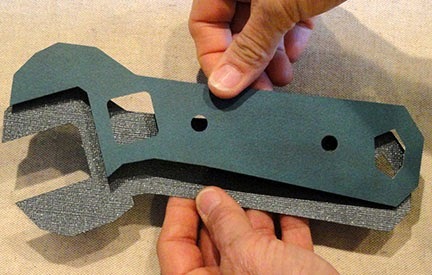 It may be helpful to insert a pencil or rod to provide something to apply pressure against during the gluing of this tab. 4. Insert box end tabs inside the box, then fold front tab down and glue in place. 5. 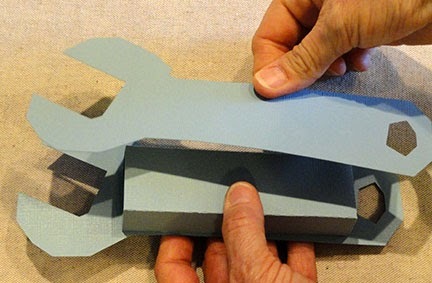 Center and attach the box to the backside of the front wrench base shape, using perforation lines as end placement guides. 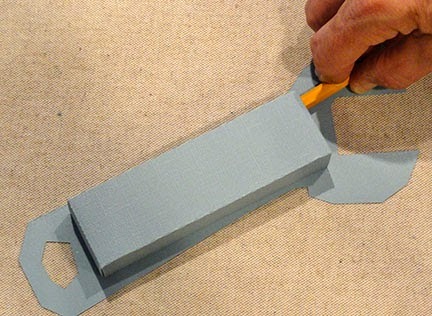 It may be helpful, once again, to insert a pencil or rod inside the box to help apply pressure to the edges that are being glued together. 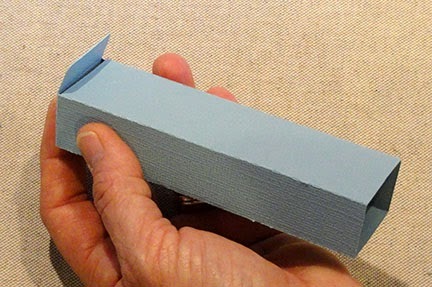 Move the pencil around inside the box interior, keeping it as flat as possible to help the adhesive grab at all parts of the attachment surfaces. 6. Turn the assembly over and repeat the process of aligning and gluing the box bottom to the backside of the back wrench base shape. 7. 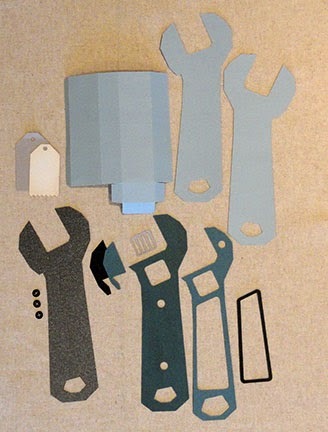 Assemble the decorative shapes onto the separate wrench front base shape. Here, just the first body layer is being placed. Refer to the next image to complete placement and attachment of all decorative shapes. 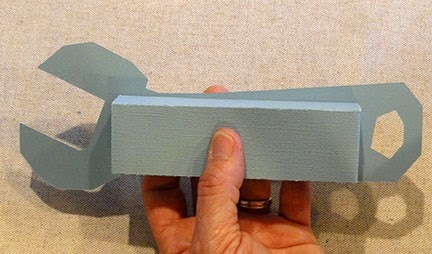 NOTE that the wrench front base shape color will show through the worm screw hole. 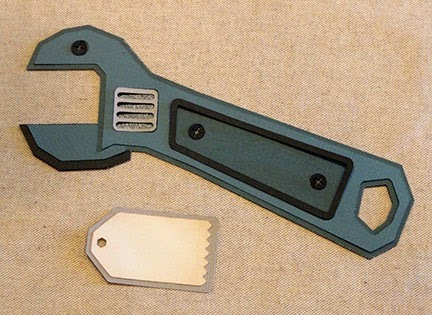 Here are the completed decorative wrench shape and the two-layer tag. 8. Position and glue the decorative assembly front over the front base/box shape. 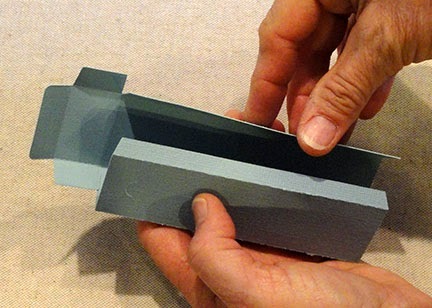 Apply pressure to ensure that all surfaces of both pieces attach well. 9. 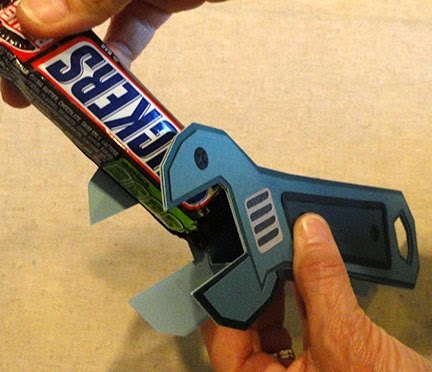 When completed, insert the candy bar of choice into the "head" opening and into box. Other bars that work in the original size include: 100 Grand, Butterfinger, Whatchamacallit, Almond Joy, Cadbury Caramello, Milkyway (several flavor variations), Snickers Almond, 3 Musketeers. Slight enlargement of the ENTIRE cut file (excluding tag, perhaps) may provide a size that would fit other, larger, bars.